If I Ran the Zoo is an interactive play area for kids and their energetic parents. 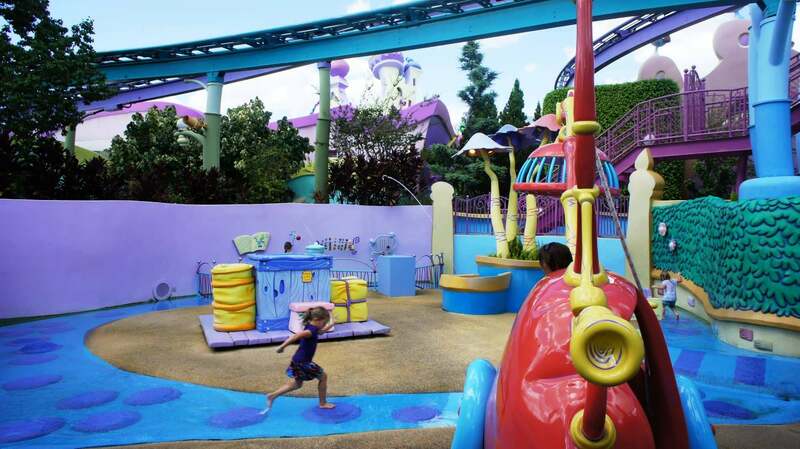 Filled with fanciful Dr. Seuss animals and contraptions, there is a world of fun to be had here with a little imagination. If I Ran The Zoo at Universal’s Islands of Adventure. We found this area by accident! We thought we were getting in line for the carousel, but instead found ourselves going through a small maze. Preschoolers and toddlers will love this area! Everything is bright and happy in a typical Dr. Seuss style. There are peep holes, ride-on creatures, water and sun. Even the hedges get in on the fun! If I Ran the Zoo is a great place for little kids to play and cool off, especially while some older ones are experiencing Hulk. The little river through the area is fun for them to splash and play in, and all the other things to see in the play area pique their interest and keep them entertained. This "zoo" is a must-do! No lions, tigers, or bears to view. Will you enter the cave to search for the elusive Natch? Or continue the journey to discover a zany pet? Winding through the hedges, don't leave mom behind on the path. When you find a tub,spray the water to discover who's taking the bath. Lucky for parents the entire area is surrounded with a low wall on which to sit. Goodness knows, my family sure had fun! I happened by this little play area while checking out Seuss Landing shortly after giving birth to a little girl in 2012. At the time I was there, she was only 3 months old and obviously too little to bring to a theme park. She's almost a year old and still probably too young. Despite that, I cannot wait until she gets big enough to experience this part of the park. If I Ran the Zoo was one of my favorite Dr. Seuss books as a little girl. I love how the area looks like it's been created by Gerald McGrew himself with all sorts of little nooks and crannies to explore. As I observed the children in the play area, it was heartwarming to note how much fun they all seemed to be having with their parents. I am greatly looking forward to passing my love of this particular work on to my little one and sharing in her experience.